Sulfur dioxide is a pungent, toxic gas found in Earth’s atmosphere. In addition to harming human health, the gas affects the environment by interacting with water vapor to produce acid rain. The gas also can react in the atmosphere to form aerosol particles that lead to outbreaks of haze and other health and climate problems. Natural sources (volcanoes, fires, phytoplankton) produce sulfur dioxide, but burning sulfur-rich fossil fuels—primarily coal, oil, and petroleum—is the primary source of the gas. 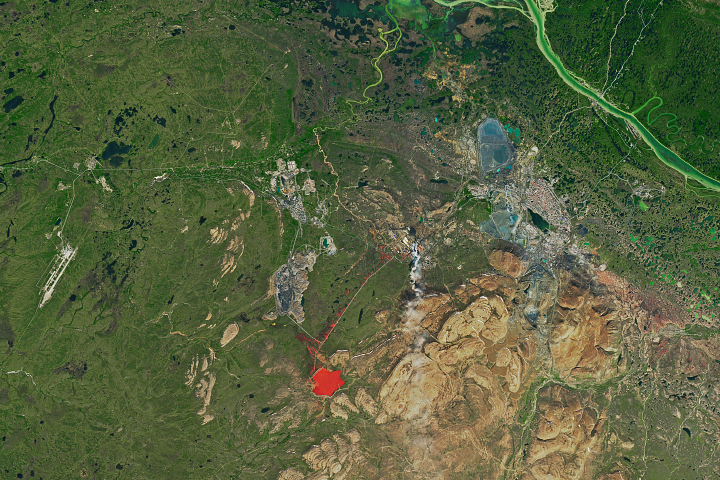 Smelters ovens, which are used to concentrate metals found in ore, also produce sulfur dioxide. While government-led efforts have reduced sulfur dioxide levels in some parts of the world, India continues to see rising levels of the pollutant, a new analysis of satellite data shows. 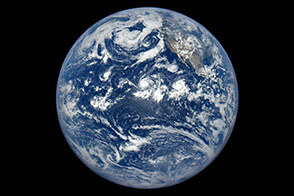 The observations were made by the Ozone Monitoring Instrument (OMI) on the Aura satellite. The study, led by Nickolay Krotkov of NASA’s Goddard Space Flight Center, was published online in Atmospheric and Chemistry Physics Discussions. 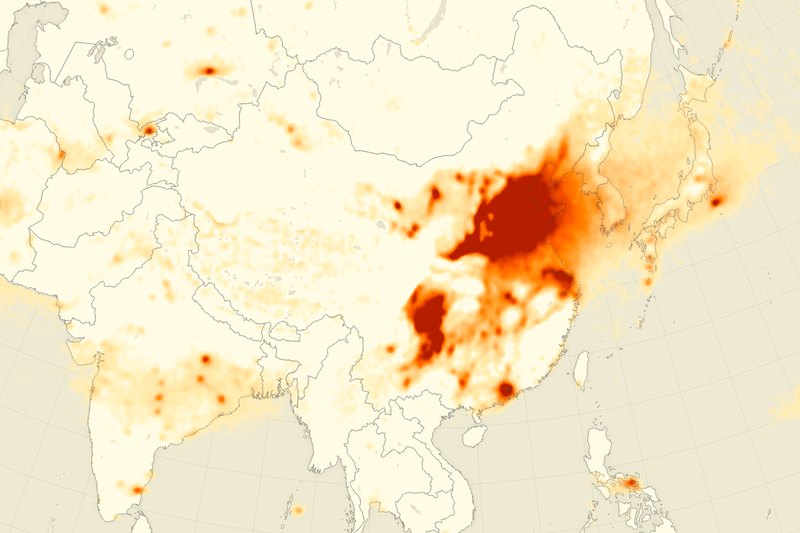 Trends over Asia, the region that now emits the most sulfur dioxide, were mixed. While India saw levels of the gas double between 2005 and 2014, the air over eastern China saw sulfur dioxide decline starting in 2007. 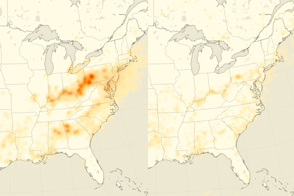 The maps above depict multi-year averages of sulfur dioxide concentrations as measured by OMI. The upper map shows the average for 2005–2007; the lower map shows the average for 2011–2014. 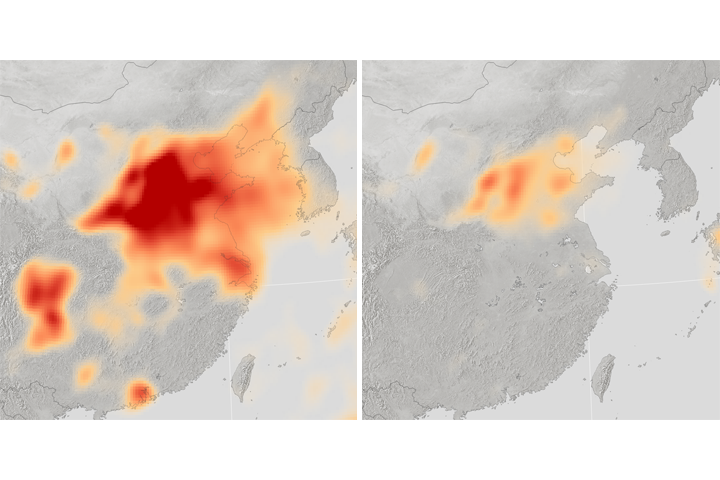 Levels of the gas were particularly high in the North China Plain, over the Yangtze River Basin around Shanghai, and in the Sichuan Basin. In India, the biggest hot spots were over industrial areas in Chhattisgarh and Odisha. 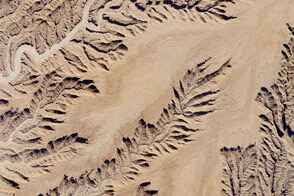 Turn on the image comparison tool to see where levels of sulfur dioxide changed. The differing trends are likely the result of different approaches to regulating the pollutants in China and India. China’s first major effort to reduce sulfur dioxide emissions began in 2007 in anticipation of the 2008 Beijing Olympics. In 2011, as part of the government’s Five-Year Plan, officials set ambitious targets for emissions reductions. Several strategies were used, including the widespread installation of flue gas desulfurization devices on power plants; switching to coal with a lower sulfur content; and closing coal-fired power plants in favor of less-polluting energy sources (natural gas, wind, and solar). 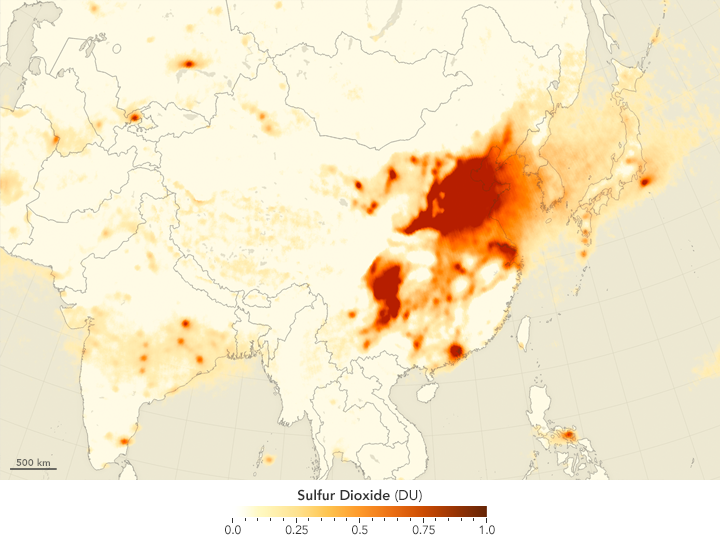 While sulfur dioxide levels over China remain the highest in the world, the new strategies and a slowing of the Chinese economy led to a 50 percent reduction in emissions of the gas between 2012–2014. Wang, S. et al, (2015, November 15) Satellite measurements oversee China’s sulfur dioxide emission reductions from coal-fired power plants. Environmental Research Letters, 10 (2015). NASA Earth Observatory maps by Joshua Stevens and Jesse Allen, using data provided courtesy of the Aura OMI science team. OMI was developed through a partnership between NASA and the Dutch and Finnish meteorological institutes and space agencies. Caption by Adam Voiland. 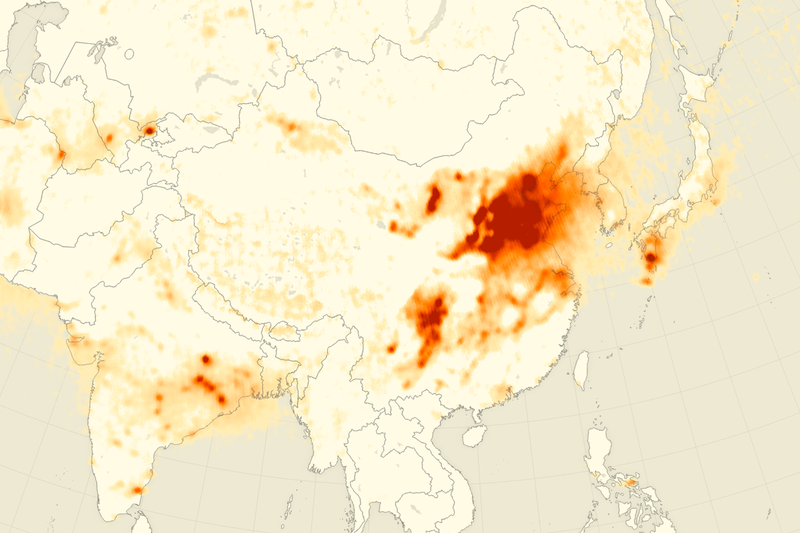 A decade of satellite observations show how levels of a common air pollutant have changed over Asian skies. Krotkov, N.A. et al, (2015, October 1) Aura OMI observations of regional SO2 and NO2 pollution changes from 2000 to 2014. Atmospheric Chemistry Physics Discussions, 15 (19), 26555–26607. 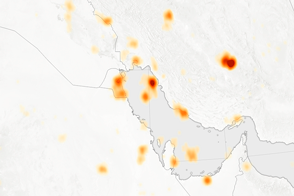 NASA Earth Observatory (2013, December 20) Sulfur Dioxide Increasing Over India.